You must make reservations at least 5 minutes in advance of the time at Mole Y Abuela Tampa. 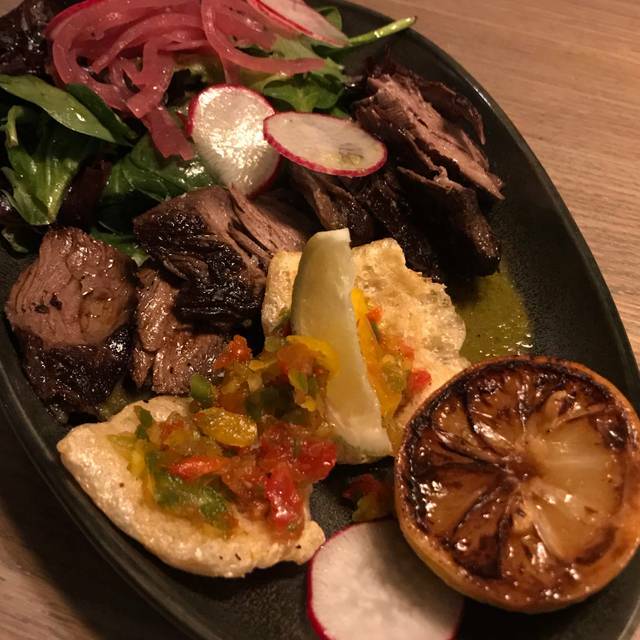 Mole Y Abuela is dedicated to providing the delectable Spanish-inspired dishes often associated with grandma's house paired with a welcoming & energetic atmosphere. Using only the freshest, locally-sourced ingredients, our recipes have been celebrated throughout generations. You are always met with warmth and appreciation, in a spirit of hospitality reminiscent of the most memorable family gatherings. We invite you to experience the joy and celebration of Mole Y Abuela. Sage was our server and was excellent! Didn’t get to go to rooftop because of rain. The food was delicious but my husband and I thought it was a bit over priced. Our server was phenomenal, she was very attentive and had amazing recommendations. We would go back for sure but not somewhere we can go often due to the price tag. Service was very good and so was the food. My only gripe is it got very loud but understandable due to very large parties near us. Was a bit over priced for what you got but I’ll come back. We live downtown and were anxiously waiting to try Mole y Abuela. Unfortunately our first experience was not the best. We went for Happy Hour with our dog. The website does not indicate the Happy Hour is limited to an inside area. Since Osteria and Franklin Manor have Happy Hour on patio I am at a loss to understand. They did allow us to have Happy Hour on the patio this once which was nice. But when the check came the wine was full price and had to be corrected. We tried all of the food items on the Happy Hour menu and were very disappointed. We have spent a lot time in Spain and love Tapas. The deviled eggs were ok except the piece of shrimp on top was like dehydrated shrimp. 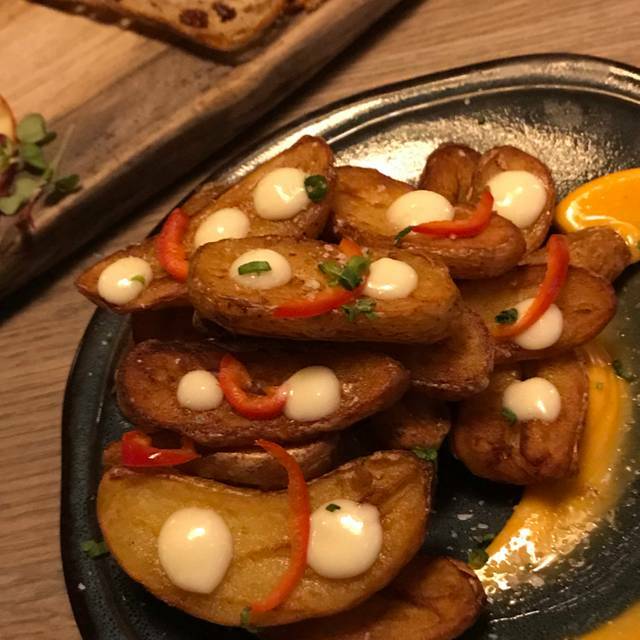 The Papas Bravas were really good but more of a side dish than an appetizer as you can only eat so much potatoes. We could not eat the Chicharrones as no taste and with no sauce it was like eating cardboard. The menu describes them with pickled jalapeño and Tajin so we expected a spicy taste. No Jalapeño and no spice. The biggest issue was the service. As most people who travel to Spain will understand eating is relaxed and you are usually there for a long time. As we were the only people on the patio it was difficult to understand why we were rushed by both the waitress and the clean up crew. It was over the top rush to go so far as trying to take plates away while we were still eating. The music was the most irritating type you can imagine and we love music with dinner. How about Spanish? We will give it one more try as we love Osteria and Franklin Manor and maybe the food is better from the dinner menu and service will be better inside. Had friends in town and wanted to try someplace new. The tapas were fun to share and were al delicious! Our waiter was very good, knowledgeable, friendly and attentive. Our booth in the very back of the place was quieter than the other booths, so we could chat easily. First booth we had was a little too noisy for conversation. I will be back to dine with my husband! I really liked our meals. Your first brunch service moved along well and if there were any hiccups, I couldn’t tell. On the shrimp escabeche, I enjoyed the shrimp and they were well prepared, but the veggies were so finely chopped they don’t really stay on the shrimp, so it was hard to get all the flavors in one bite. But the breakfast burrito, avocado toast, and bread pudding were all outstanding. The one big gripe I have about your restaurants (Osteria included) is that the price point on your octopus is way off base. It’s a dish I order frequently, but your price is $6-8 more than at any other restaurants. I tried it on my first visit, but found nothing on that plate that I can’t get elsewhere for significantly cheaper (and in some cases, better). So, I had to knock you on value. Please look at what your competitors are charging and adjust accordingly. We had a great evening with family . Food was excellent , atmosphere was nice and our server was awesome! We will be back. 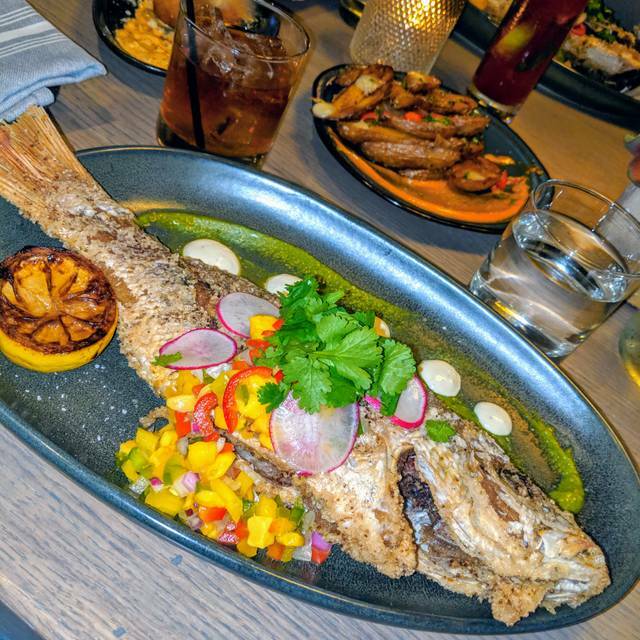 This was our first visit to Mole Y Abuela Tampa, and we were quite impressed overall. The brunch menu was just being introduced, and we were happy with the selections, quality of service, and overall value. Place was cute, liked the decor. Service was good, not excellent. The noise was way too much, the point that you could not hear the waitress or even talk to my husband, we could not hear each other. I do not recommend this place for a night out with your partner, or date night, you will not be able to hear each other. Rooftop was nice, even though it was crowded. Nice place, but not a place to relax. Food and drinks a little over priced for the quantity and quality. Brandon, General Manager at Mole followed up personally about our recent experience, because our visit didn't exceed our expectations. He was gracious and we appreciate going the extra step. Delicious food, great service! I've had dinner and brunch there and both were outstanding. Will definitely go again! 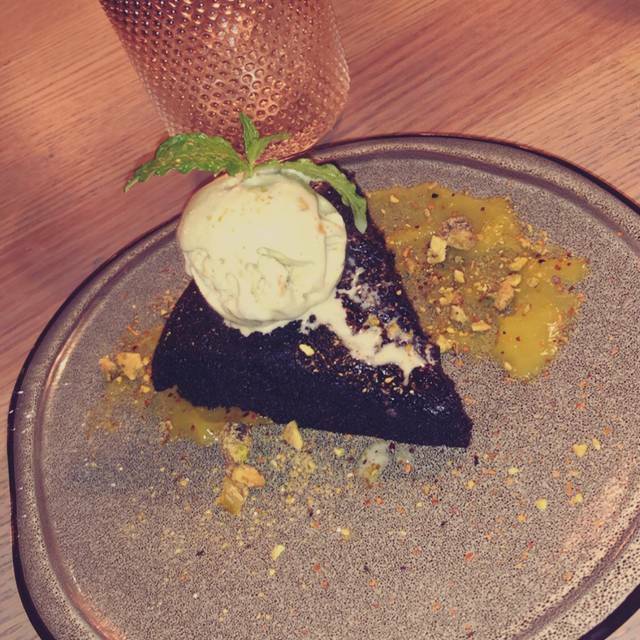 I was impressed with Mole Y Abuela’s food and service. The food was tasty and appealing and the service was attentive and very friendly. I’m definitely coming back! Excellent all the way around. Great drink menu, food, and ambiance. 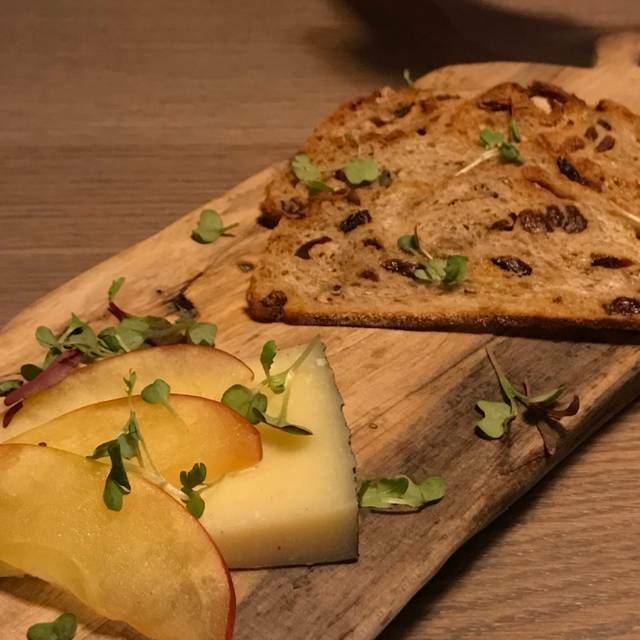 This restaurant is definitely a great addition to the Downtown Tampa area, excellent service, delicious tapas and craft cocktails!. Everything we ordered was excellent. It was a busy night but the food came out surprisingly fast. Only two bartenders on the rooftop dinning area so the drinks took longer. They were showing the gameon a wall using projector screen AWESOME. The prices were a bit too high priced. Definitely worth the experience tho. Our server Andrew was awesome!!!! Outstanding food, lots of choices including the new brunch menu, high quality plates. Enjoyed the ambiance too. Will return for sure. Food and service were good, but the meals were way too expensive for what you received! Mole margarita muy rica aunque un poco cara. Los camarones al ajillo deliciosos, el pan con tomate lo recomiendo y el ambiente nos encanto. El lamb al grill no nos gusto mucho y los vegetales tenian mucha grasa. Espero q tomen esta critica de manera constructiva y lo puedan mejorar. Igual me encanto asi q los recomendare. We sat at a rooftop table, and it was absolutely beautiful! Service was fantastic, went with a group of girls and we didn’t really know what to order. Our server helped us order a variety of options that suit everyone’s needs, and everything was so tasty. Bacon wrapped dates omg! Drinks and food were consistently great, and service was excellent. I really enjoyed how the server actually knew the menu and what she was talking about. Makes a dining out experience so much better. Energetic environment, with a variety of cool seating spaces. Menu allows you to try several things. Looking forward to going back! Good place, nice atmosphere & food, a little expensive, but is okay. Everything about Mole Y Abuela is amazing. 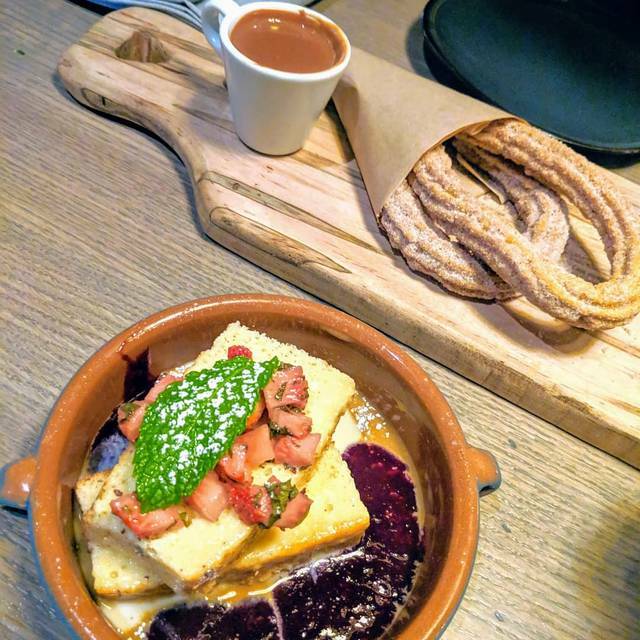 The food was delicious (don't you dare leave without getting the Churros). Most importantly, the service far exceeded my expectations. The staff was incredibly attentive. The food here was outstanding and the drinks were great. Definitely try the papas bravas, the lamb shank, and the Tampa replenish. Our server Jesse was great! Very knowledgeable on food and drinks and gave great recommendations. Highly recommend the Papas bravas and croquetas as appetizers! One of the best margaritas I’ve had also with his recommendation of a smoked tequila. They also sent me churros for my birthday. The manager Alan, stopped by to check on us and was very cordial making sure we were enjoying our experience. Will definitely be back to try other menu items. 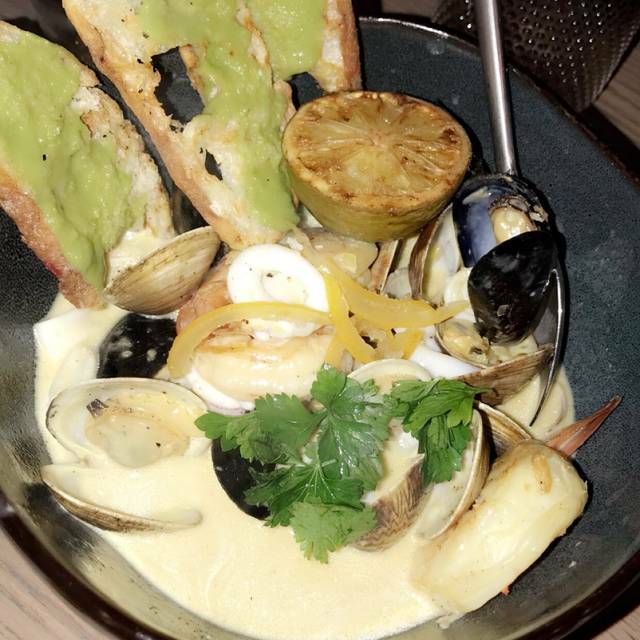 We tried several of the tapas items, but the real star for me was the “Guiso de Mariscos.” The seafood was cooked perfectly, and the broth was so flavorful. The preserves lemon in the bottom of the bowl brought a lovely citrus note to the dish that was like a little surprise. We’ll be back for sure. It was great from beginning to end. When we first arrived, we ordered ‘tapas’ which is basically an appetizer. We waited for a while and never even notice how long it was taking to receive what we ordered because we were so caught up taking in the atmosphere of the restaurant and street view. The waitress noticed it had been a minute since we ordered it and ultimately the manager came and told us they were sorry and took off the order and gave us our desert free. Great experience overall. The customer service was excellent. Beat I ever experienced in a while. We will definitely be back! 10/10! Really nice upgrades from the previous restaurant in the space! We tried many things and everything was great. Four of us dined on a Friday night and had a great time. We all loved the stuffed peppers, we should have ordered 2! The potatoes were a huge hit, along with the shrimp dish and the lamb. One of us is a vegetarian and didn’t feel there were enough choices although she enjoyed everything she tried. Cocktails were a bit pricey but good. Wine seemed to be short on selections (by the glass) and on the pour. Dining room was super loud and hard to have a conversation but we all had a great time anyway. Will definitely visit again! Concept sounded good, however way over priced for what you get. Food is mediocre. And for some of the entree listed items , they don’t even have sides (rice beans plantains etc...) to order with the meal. Sorely disappointed. While the ambience was nice, everything else left much to be desired. Our server got our order wrong on the first two tapas and forgot to put in the order for the other two tapas. She was not very attentive and passed our table several times but did not stop to check on us so it took a while to let her know that the rest of our food had not come. When she did come by she asked if we were ready for dessert, so it was apparent that she was not keeping track of our order. We ordered the lamb shank and were very disappointed in the amount of meat on the bone. For $29 we expected a more generous portion. The tortillas that came with it were cold and not pliable so it was not possible to make tacos with the shank as recommended. The mole sauce was very nice. We did mention our issues with the lamb shank and she comped us a round of drinks which was very appreciated. Everything about our experience was phenomenal. From the staff giving us hints where to park, to the hostess, bussers, food runners, management and most importantly our server, Roasanna extraordinary. As you can see from this comment we come from a hospitality background and this place is how it’s suppose to be done in the restaurant business. That’s not even mentioning the food and drinks. Can’t rave enough about the food. Everything was presented beautifully and in a timely manner. I recommend so many things as we tried almost everything. I highly recommend the duck. I do not like duck but my girl Roasanna promised me it was awesome. I tried it and I’ll only eat it there now! Don’t walk, run and try this place out! Food excellent though I'd skip the Iberico ham. Small portions, pricey. Sage, our waitress, was excellent.